Point your visitors in the right direction with these shiny new street directional signs! Use them over-top of your roads. Includes signs that fit over roads going N-S, E-W, NW-SE, NE-SW.
Includes signs that fit over roads going N-S, E-W. 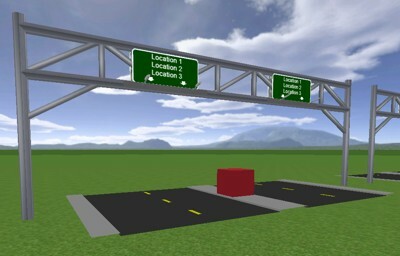 The base object will be placed in the exact center of your roads where you want your signs to be, as depicted by the rcube's in the picture below. You can delete signs that are unused (signs on the opposite side of where the traffic is coming from) to free some cell space. They are also extensible, for roads larger than 3x H width. Two sign3.rwx's can be replaced to show separate sides of a sign, if a turn-off is imminent. 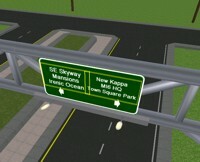 See the picture to the right, or teleport to an inworld example. As usual, some signs may sink into other things causing them to disappear. Just look around and shift them back into their desired position.